All-New 75-Minute DC Universe Original Movie Features Iconic Justice League Characters including Superman, Batman, Wonder Woman and Aquaman! Burbank, CA (December 4, 2014) The newly formed Justice League members Superman, Batman and Wonder Woman discover another super hero on the planet Aquaman and the group must band together to prevent a war between the inhabitants of land and sea as Warner Bros. Home Entertainment, Warner Bros. Animation, and DC Entertainment unleash Justice League: Throne of Atlantis . Packed with non-stop action, the brand-new 75-minute DC Universe Original Movie comes to Blu-rayTM Combo Pack, DVD and Digital HD on January 27, 2015. In Justice League: Throne of Atlantis , Cyborg discovers an imminent threat in the depths of the oceans so powerful that it rallies together the newly formed Justice League. Meanwhile, wandering thousands of feet above the ocean floor is drifter Arthur Curry, a man with strange powers who may be the last chance to bridge the ancient Atlantean world with our own. Superman, Batman, Wonder Woman and the rest of the Justice League must band together as they face off against warmongering Orm, an army of sea creatures, otherworldly weapons and perilous odds. In this all-new epic adventure from the DC Universe, mankind's only hope of escaping from the darkness lies with the guiding light of a man Aquaman! 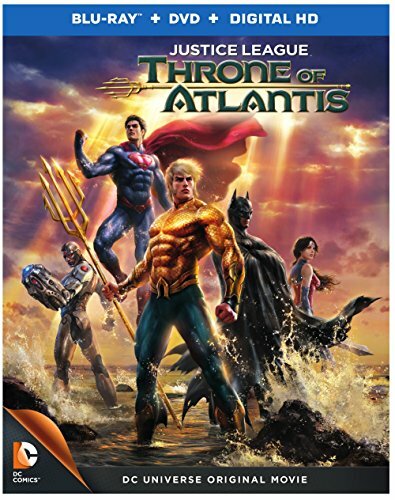 "We are thrilled to introduce this exciting new Justice League film to fans with the release of Justice League: Throne of Atlantis ," said Mary Ellen Thomas, WBHE Vice President, Family & Animation Marketing and Partner Brands. "As the Justice League saga continues to expand, fans are looking for exciting new adventures for this vibrant group of super heroes and this brand-new film is sure to deliver!" *	Scoring Atlantis: The Sound of the Deep - Every great film needs a great musical score. Filled with emotion, music takes us on a dynamic journey as we adventure with the hero. Throne of Atlantis takes us on that quest through the eyes of Arthur Curry. *	Robin and Nightwing Bonus Sequence - Producer James Tucker provides video commentary for this exciting bonus sequence where Robin and Nightwing join forces. *	Throne of Atlantis: 2014 New York Comic Con Panel - The entire, lively one-hour panel discussion between actor Matt Lanter, producer James Tucker, screenwriter Heath Corson, character designer Phil Bourassa and dialogue director Andrea Romano. *	Villains of the Deep - From Ocean Master to Black Manta to King Shark, each villain operates from his own deep sense of conviction, presenting an incredible challenge for the hero in Arthur Curry, aka Aquaman. This documentary goes into the biographical details of the villains. *	A Sneak Peak at Batman vs. Robin - An advance look at the next DC Universe Original Movie with the creators and cast. Warner Bros. Animation (WBA) is one of the leading producers of animation in the entertainment industry, producing and developing both CG and traditionally animated projects for multiple platforms, both domestically and internationally. For TV, WBA produces series such as Teen Titans Go!, The Tom and Jerry Show and the upcoming Be Cool Scooby-Doo! and Wabbit A Looney Tunes Production for Cartoon Network; original animated DC Nation shorts for Cartoon Network; and the forthcoming Mike Tyson Mysteries series for Cartoon Network's Adult Swim. As the home of the iconic animated characters from the DC Comics, Hanna-Barbera, MGM and Looney Tunes libraries, WBA also produces highly successful animated films including the DC Universe Original Movies for DVD. One of the most-honored animation studios in history, WBA has won six Academy Awards(R), 35 Emmy(R) Awards, the George Foster Peabody Award, an Environmental Media Award, a Parents Choice Award, the HUMANITAS Prize, two Prism Awards and 20 Annie Awards (honoring excellence in animation).